If you ask your friends from Eastern Asia or your fellow Asian food lovers about Asian markets, it is no secret that they will probably tell you about a market called "United Noodles." Tucked away in the corner of a busy street in the Seward neighborhood of Minneapolis, United Noodles has been serving the community for years. However, it is not until recent years that United Noodles has gained itself a new status: a cult. Specifically, Unideli, the deli inside of United Noodles, gathered a cult following for its good quality ramen, BBQ pork, and house-brewed kombucha. In this issue of Chef Says, we interviewed the chef of Unideli, Dan Prentice, for his house-brewed kombucha. If you recall from our last issue, we told you that takoyaki = tako + yaki, which means octopus + grill. You can probably infer that kombucha, another word with japanese etymology = kombu (which means kelp) + cha (which means tea). You would be right 100%, except kombucha actually has nothing to do with kombu at all, and even more strangely, no one knows where the name kombucha comes from. 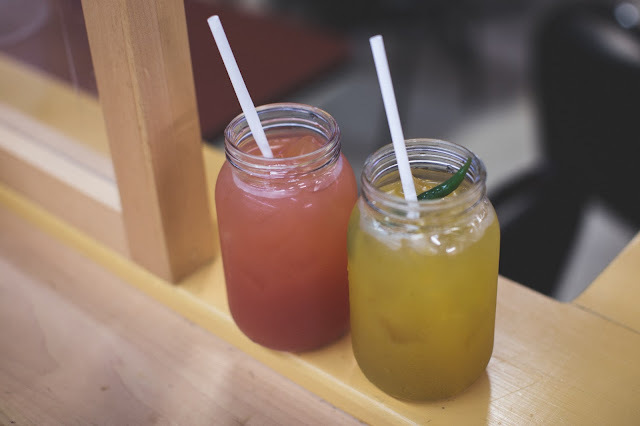 Kombucha is actually a form of fermented tea, and just like anything fermented, such as yogurt or vinegar, it is done so with the help of microbes. In kombucha's case, the microbes used is called SCOBY. 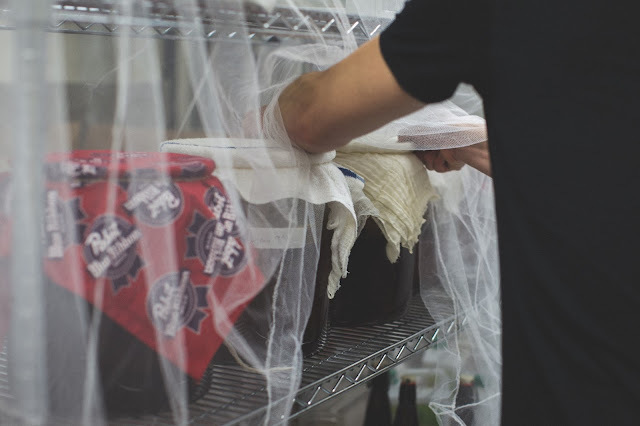 SCOBY stands for "Symbiotic Culture of Bacteria and Yeast," and like how it sounds, it's a symbiotic culture where bacteria (mostly Gluconacetobacter xylinus) and yeast work together to bring you the final product of a fizzy, slightly sour beverage. Here's SCOBY under a microscope. The dissolved carbon dioxide is what gives kombucha the fizzy property (just like carbonated soda). The acetic acid is what gives kombucha the sour taste (just like vinegar). Occasionally, you will taste some alcohol, and that is due to the incomplete digestion of the ethanol by the bacteria. 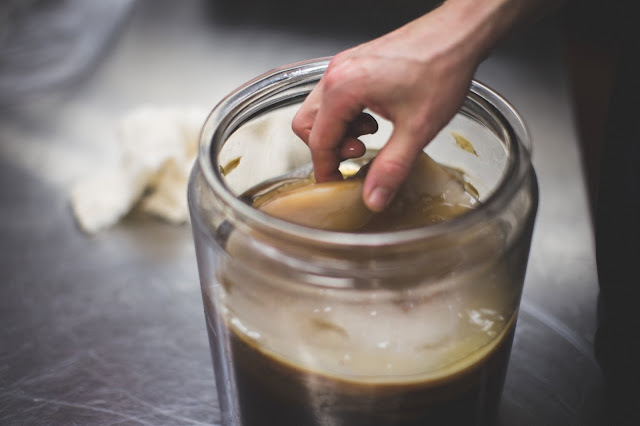 You can learn to make your own SCOBY here. 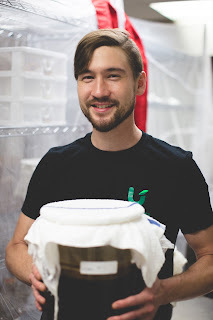 Or, if you are a loyal fan, Chef Dan will probably give you his SCOBY culture. Health claims of kombucha: what's real and what's not? There have been many health claims for kombucha, ranging from stimulating the immune system to preventing cancer to improving digestion and liver function. However, there's no scientific evidence to support these health claims. What kombucha is rich with is nutritional benefits. Because remember, quite simply, the base ingredient of kombucha is tea. Therefore, it has all the health benefits that comes with drinking tea. It is also loaded with vitamins and minerals as a result of fermentation. It also contains live probiotic cultures, so it's likely to aid digestion. As Chef Dan put it: "It tastes good, and I feel good drinking it." Kombucha has gained spotlight in the recent years and is becoming a household name of a healthy and delicious mealtime beverage. 1. What kind of tea do you use when you make your kombucha? Dan: I use different kinds of tea for different flavors. 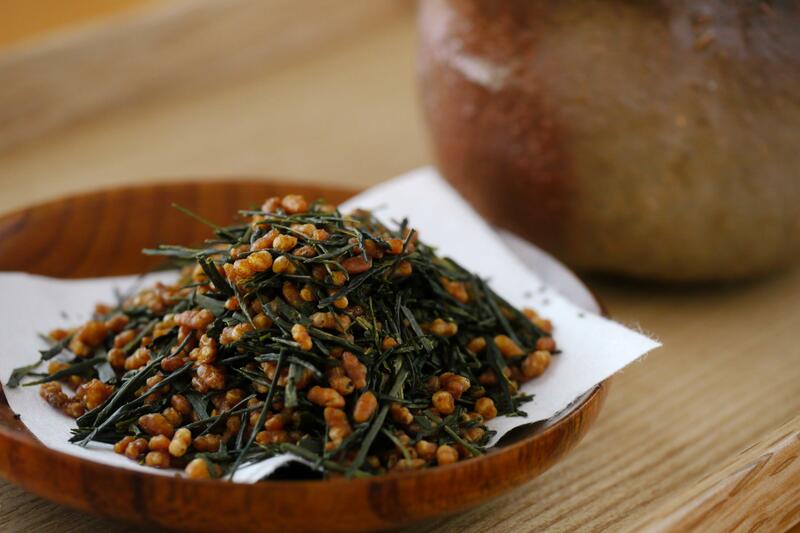 For example, for our lychee watermelon flavor, I used lychee infused black tea; and for the Thai chilly cucumber, I use oolong tea and genmaicha (), which is a Japanese green tea combined with roasted brown rice. I try not to use herbal tea because the oils in herbal tea usually don't mix well with the SCOBY. 2. How do you make your kombucha so it's so perfectly balanced with sweetness from the fruit flavors and the sourness? Dan: It's about timing and following the right steps. I usually start everything off with just tea+sugar in the fermentation tank. The SCOBY will turn that into a raw flavored kombucha, then I will add the fruits and flavor it. I usually do 1/3 tea plus 2/3 fruits+flavorings. To control the sourness, timing has to be right. For example, if you pull the kombucha out of the fermentation tank and bottle it and let it sit for a while, it will become more sour as the CO2 increases. Therefore after bottling, I will try to serve the fresh kombucha right away. I try to contain the pH of my kombucha between 5-6, which is slightly acidic. 3. What's usually the alcohol content in the kombucha? Dan: Kombucha usually is around 0.5% in alcohol content. However, if you let it sit in the bottle for too long, the alcohol content can increase to 1%. 4. How long does it take usually to brew one batch of kombucha? Dan: Usually 12 days, and we usually sell out very quickly, so I have to keep a schedule to make sure that we have a continuous kombucha supply. 5. How much sugar do you use to start with? Dan:1 cup of sugar per gallon to start with. I am trying to brew with some organic honey; however, raw honey won't work because it is antiseptic, which means it will kill the SCOBY bacteria. 6. What's the brewing condition? Dan: I use sanitized glass/clay containers because I am afraid that plastic containers could react with the acid. 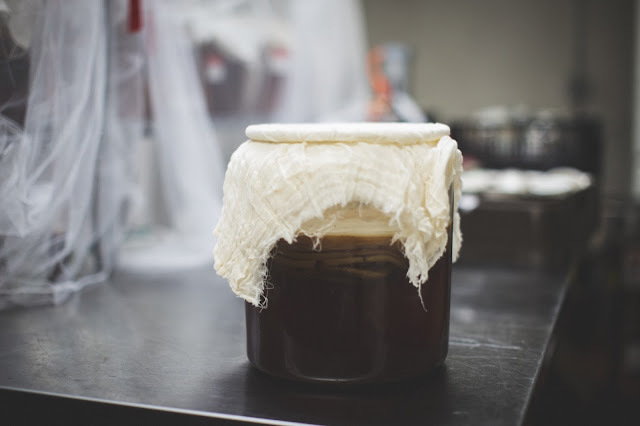 The SCOBY usually sits on top of the tank because it's lighter than water, and therefore it serves as a protective layer against all of the other bacteria. I cover the container using a breathable cloth because all chemical reactions are aerobic. I also keep everything room temperature and away from sunlight, because the UV in sunlight will also kill off the bacteria. 7. Where do you get your ingredients from for kombucha and for the restaurant? Dan: We source our materials from all over the place. Some of the materials I use for the kombucha are directly flown in from Japan and others are from United Noodles or other wholesalers. The noodles and tantanman on the menu are produced by a local company. We always try to source sustainable and healthy materials from companies that are responsible and humane. 8. Could you tell us what inspired you to cook and became the chef at Unideli? Dan: I grew up in the Minneapolis suburbs and pursued a psychiatry degree in college. After graduation, I worked at group homes for 10 years. Sometimes the house would be short on staff so I would help with the cooking process and started cooking for everyone. As time went by, people liked the food I cooked. There was this one client who was extremely stubborn about what he ate, so you'd imagine what kind of a shock it is for his parents to come visit one day and find him eating seafood payiya instead of PB and J for lunch. I then became manager for the house. After working there for a decade, I wanted something different, so I decided to pursue my passion for cooking. I started working as a line cook and demonstrated some quick learning skills. So when the position of the chef at Unideli opened up, I gladly stepped into this leadership role. 9. What other changes are coming to Unideli? Dan: The kombucha flavors will change now that fall is upon us. I would like to experiment with pumpkin flavor that's made out of real pumpkins, as opposed to the pumpkin spice that most people use. I would also like to bring more Thai inspired dishes into Unideli. "Trying new food is definitely a learning experience and I hope that your experience at Unideli is positive. If you are curious, don't be shy to inquire about ingredients that you don't know about in your dishes. I would be glad to tell you what they are, and if you want to try them out on your own, you can buy most from United Noodles."